The most impressive design detail of the Dolder Grand in Zurich, a hotel with $400 million worth of new design details, may be the easiest to overlook: the entryway to its gymnasium. To reach the gym from the spa reception, you walk through a curved white corridor whose clinical starkness is disrupted by a series of lush, oversized flowers painted along the walls. At the other end, the door into the massive fitness space is frosted to barely above eye level, allowing the weight lifters and treadmillers inside to see out while keeping anyone else from looking in. This marriage of elegance and privacy, the result of a four-year head-to-toe makeover by Foster and Partners, has helped transform the 1899 kurhaus (health spa) into a stunning showcase for contemporary style. 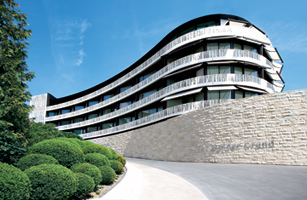 Set in the hills above Zurich, the Dolder's original turreted hotel melds beautifully with Foster's new slick, curved wings, one housing the 21-room spa (which offers everything from shiatsu to Botox), the other facing a nine-hole golf course. Each of the Dolder's 173 rooms is richly decorated, none more so than the quartet of über-suites inspired by past guests such as sculptor Alberto Giacometti (filled with organically shaped furniture) and the Rolling Stones (a psychedelic melange of purple and black). And the new Dolder (www.doldergrand.ch) is as green as it is grand  underground heat sources are used to help keep it warm in winter. Further proof that great design is all in the details.